This year’s new-look Silverstone 24 Hours race will feature an entry for a combined squad of four Barwell Motorsport drivers, aboard a JJ Motorsport-run BMW M235i. 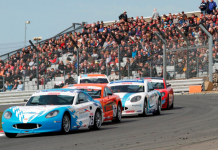 Team Principal Mark Lemmer will share a car in the Silverstone encounter with Russian driver Timur Sardarov, the pair having contested last year’s race in a Marc Cars Ford Focus. They will team up with two of Barwell’s 2016 Blancpain Endurance Cup drivers, Mark Poole and Richard Abra. The first Lamborghini Blancpain Super Trofeo Europe pre-season test days were held at the Piero Taruffi racetrack in Vallelunga, Rome, on March 22 and 23, in advance of the opening round at Monza over the weekend of April 23-24. Black Bull Ecurie Ecosse has confirmed plans to compete in the hotly contested GT4 category with Scottish juniors, Ciaran Haggerty and Sandy Mitchell. As part of the development of the new McLaren GT4 car (announced last week) the team will run the McLaren 570S GT4 alongside its GT3 campaign, allowing the duo to work closely alongside factory driver Rob Bell and Ecurie Ecosse Director and driver Alasdair McCaig. The ELMS pre-season official tests took place a France’s Circuit Paul Ricard on Tuesday & Wednesday this week with 42 cars entered. Of the two tyre manufacturers, the Dunlop shod cars appeared to be adapting better to the track conditions overall. Pierre Thiriet in the #46 Thiriet by TDS Oreca 05 Nissan set the fastest LMP2 lap in three out of the five sessions; Nic Jonsson in the #40 Krohn Racing (Tues AM) and Stefano Coletti in the #32 SMP Racing BR01 (Tues night) set the other session’s fastest times. The #66 JMW Motorsport Ferrari took fastest car honours twice for LM GTE, AF Corse took the remaining sessions. Somewhat surprisingly, the Beechdean Aston Martin V8 Vantage GTE was continually a few seconds off the pace. 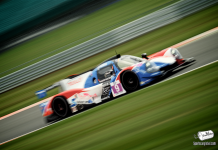 New team Panis-Barthez showed their Ligier JS P3 and driver combination to be working well with the cars consistently at or near the top of the LMP3 timing charts. The Oak Racing squad’s Erikc Maris crashed his Ligier JS P3 heavily at turn 7 on Tuesday afternoon and was sent to hospital for checks. He was reported to have been checked out as being fine and released. The Kox Racing Ligier and ARC Bratislava Ginetta left Ricard overnight and the incoming Audi WEC team taking over their garages. In Wednesday’s final session, Inès Tattinger put in a string of fast laps in the #29 Pegasus Morgan Nissan to continually top the LMP2 times until, just before the rain arrived, Pierre Thiriet put in the final of his fastest times to deny her the overall top spot. So24! by Lombard Racing officially presented their Ligier-Judd JS P2 and drivers, Olivier Lombard, Vincent Capillaire and Jonathan Coleman to the media during the Tuesday lunch break. Due to financing problems TDS Racing withdrew their Aston Martin V8 Vantage GTE from their Le Mans entry. First reserve was Greaves Motorsport (Gibson 015S-Nissan) who decided not to take up their invitation. The entry now passes to Portuguese team Algarve Pro Racing who will enter their Ligier JS P2-Nissan in the LMP2 category. 29 cars took to the track for the official FIA WEC pre-season tests at Le Castellet. 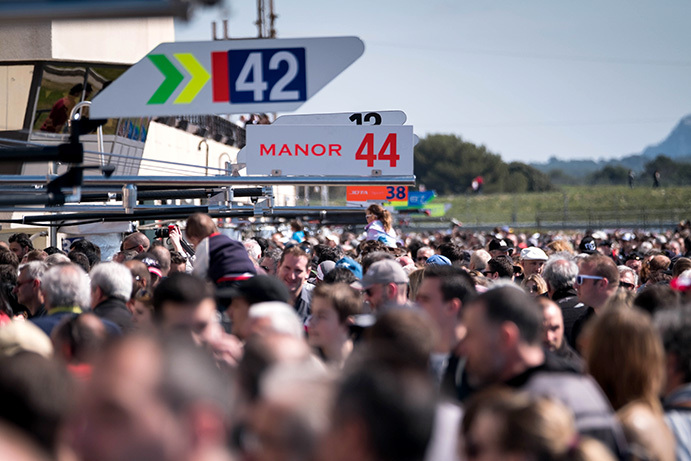 Saturday saw the public invited into the tests with Thousands of fans flooding into the circuit, taking advantage of the great weather and free entry. Audi launched their 2016 R18 online via the Audi TV channel. the new car features a revised V6 turbo-diesel engine with 8MJ hybrid (its hybrid drive system is battery-operated for the first time) and develops in excess of 1000hp. 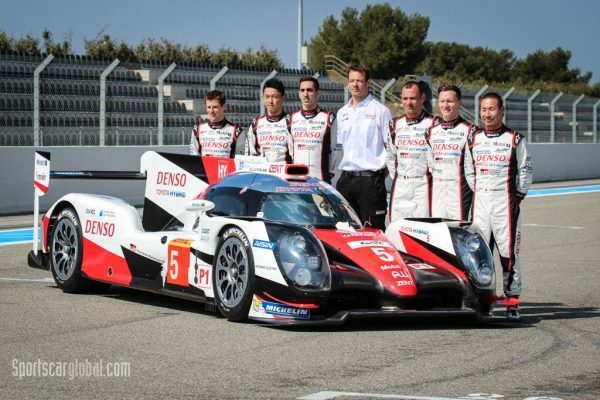 Toyota officially unveiled their 2016 WEC LMP1-H challenges, the TS050 at Paul Ricard a day ahead of the WEC’s Prologue. The new car features a completely re-designed chassis and all-new 2.4litre, twin-turbo, direct injection V6 petrol engine combined with an 8MJ battery-based hybrid system. Reigning World Champions Porsche also unveiled their 2016 919 Hybrid, details of which have been earlier reported. 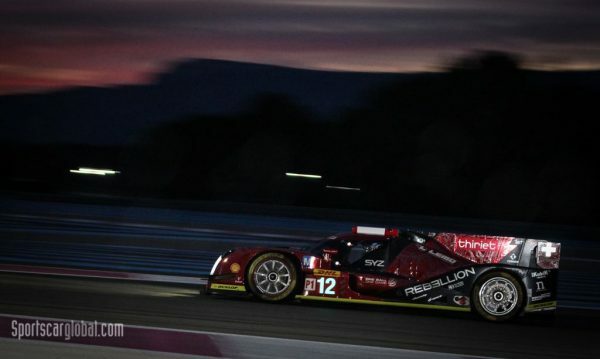 Rebellion Timepieces, owner of the Rebellion LMP1 team and sponsors of the Thiriet by TDS team announced that 2014 World Champion and Toyota LMP1 driver Sebastien Buemi will join the company as a brand ambassador. Porsche took a clean-sweep of the five sessions of The Prologue, the team’s fastest time being 1:37.445 which Brendan Hartley set in the Day 2 afternoon session. Worthy also of note is that the speeds set by Porsche are faster than the Prologue in 2015 yet achieve with a 7.5% reduction in fuel flow – quite an achievement. Stéphane Sarrazin in the #5 Toyota TS050, running the low-downforce aero package, set the fastest speed of the Prologue clocking up a whopping 340.7 kph through the speed trap. Lots of new liveries on display at the Prologues but the new Rebellion one stood out for us, it had, perhaps unfairly, received some criticism online but it really comes alive at night – a real crown pleaser. At the end of day one, less than 1.5s separated the top 5 LMP2 teams. Oliver Webb made his LMP1 debut this afternoon in the ByKolles CLM P1/01. With Simon Trummer due to have surgery next week (requiring a last-minute cancellation of his plans to be at Ricard) and Pierre Kaffer currently on official testing duties for Audi in Japan, this left Webb as the lone driver for the team throughout the two days of the Prologue. Signatech Alpine topped the LMP2 pack with a fastest lap of 1:46.974 set by Gustavo Menezes in the #36 car. The Aston Martin V8 Vantage GTEs while looking stunning appeared to be somewhat off the pace of the other GTEs setting laps 1-2s slower than the pack. The AF Corse Ferrari 488 GTEs were the cars to beat in the GTE Pro class, the fastest being the #51 of Bruni & Calado setting a 1:57.808 lap time. Larbre Competition‘s Corvette C7 took lap time honours in the GTE Am with Pierre Ragues clocking in a 1:58.268 in the morning session of Day 1. Full notes from Day One and Day Two. As reported by Sportscar365, there is still some major unrest between IMSA and the ACO regarding the DPi regulations and theses cars eligibility for Le Mans due to the plans not to use the spec Cosworth engine management systems. ACO President Pierre Fillon hinted that rather than running in the LMP2 class they could potentially be placed in LMP1 Privateer, as a non-hybrid prototype. 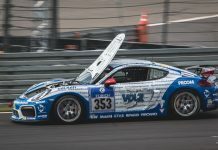 Some well loved faces make a welcome return this year when Wolf Henzler, Peter Dumbreck, Martin Ragginger and Alexandre Imperatori will take the wheel of the new FALKEN Porsche 911 GT3R (991) in the VLN Championship as well as the Nürburgring’s 24h-Race. Speaking on the way the announcement was made Stephan Cimbal, Head of Marketing at Falken Tyre Europe siad: “The FALKEN Motorsports fan community was buzzing with speculation about the new race car, so we decided to fuel that excitement. We launched the campaign by featuring the sale of our old Porsche and then added information bit by bit to whip up the tension. It worked really well!”. Sneaky, but we like their style! Participating in two really challenging racing series is clearly not enough stress for Grasser Racing Team, so, besides Blancpain Sprint and Blancpain Endurance Series, this year the team will also participate in the German ADAC GT Masters with its Lamborghini Huracán GT3 cars.